This book outlines key places, people, customs, and societies located in the wilderness of Rifts Africa. 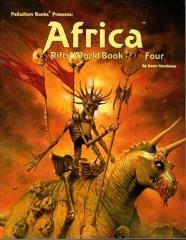 The demonic Four Horsemen of the Apocalypse threaten to destroy all life on Earth. Once life has been obliterated on Earth, the monsters will use the dimensional Rifts to carry their destruction throughout the Megaverse®! If they can be defeated one at time, the Earth and the entire Megaverse may be spared. Failure means oblivion.